Summer is a time to relax and go on vacation. Why not also gather some inspiration for wargaming to boot? Jonathan shares a few of his favorite wargamer destinations. If we didn’t cover one of your’s, then please share it with us on Facebook, Twitter, or via e-mail at cwfgamecast@wargamingforums.com. The June 2014 issue is briefly, very briefly, reviewed. It is worth picking up if you can. The cost is 4.25 GBP. 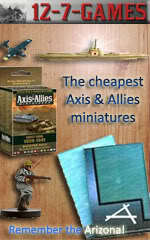 Visit Scale Military Modeller International for more information. On our Facebook page fans shared some of their favorite wargamer destination spots. Listener Adrian said “Gettysburg. Can’t get enough. Henry Hyde, editor of Miniature Wargames with Battlegames AND author of The Wargaming Compendium has released a new product. The Wars of the Faltenian Succession compiles his 12 part series (originally published in Battlegames magazine) into one PDF. It has color photos, live links to external websites and other pages in the pdf. Henry Hyde, editor of Miniature Wargames with Battlegames AND author of The Wargaming Compendium, will be the featured guest on August 4, 2014.